Politics. Religion. Social issues. There are some topics of discussion wherein conflicting views of ingrained opinion can make communicating and resolving differences a daunting task, to say the least. Gray, a new game by Intuition Games' Mike Boxleiter and Greg Wohlwend (Effing Hail) , does a sublime job of illustrating the complex nuances of communication and popular opinion. The game is set against a cityscape with a monochromatic sea of pedestrians cascading from one side of the street to another. You are cryptically instructed to “bring as many people as possible to the side of peace.” All of the block-figure pedestrians begin as “white.” Your character is identical in shape and size, but is shaded black. Some of the pedestrians by are highlighted by outlines, and you can initiate a conversation with them by pressing the spacebar. When you begin a conversation, the camera zooms in, focusing on a “dialogue box.” The person you are trying to convince/convert will “speak,” which sends sound-waves toward your character. By hitting the spacebar, you can send your own sound-waves back to them. 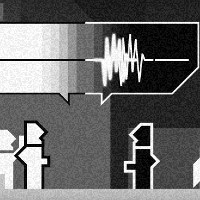 Time your conversation so that all of the sound waves cancel each other out in the middle of the dialogue box, and that pedestrian will convert to your color. Find another pedestrian, rinse and repeat. The game isn’t very long, and the couple of included twists can’t really be described without the risk of ruining the experience. That said, the game has an ending that’s definitely worth seeing for yourself. Gray is one of those rare gaming treasures that’s incredibly simple to play, but that has a thematic heft which far outweighs it’s mechanical and presentational simplicity. Play through to the end, and you may feel (as I do) that it’s a compelling example of how some games can, in fact, be art.